With a CD having a diameter of 12 cm, and the inner non-writable part having a diameter of 4 cm, we get a total writable area of around 100 cm². I read somewhere that the different densities of the “gold, silver, aluminum” layer are between 20 to 100 nanometers (billionths of a meter). Assuming the worst case scenario, 100 nanos, we get a total gold volume of 0.00001 cm³. At a gold density of about 19.5 g/cm³ this volume equals 0.000195 g. With one troy ounce equal to 31.1 g., this weight of gold equals 0.00000627 troy oz., or rather, one troy ounce of gold is good for 160,000 CD-Rs. At a gold price of U$S 450 per troy ounce, there is U$S 0.0028 gold per CD-R, or 0.28 cents worth of gold. Of course, the density of the gold layer could be as low as 20 nanometers. In that case, the gold content in the CD would be worth 0.06 cents, and one ounce of gold would be good for 800,000 CD-Rs. So there you have it. One final step. 10 billion writable CDs are sold every year (versus 20 billion audio CDs). 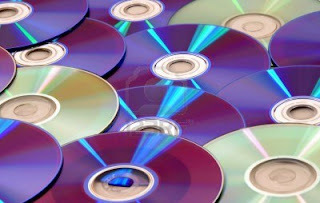 The gold/silver CDs are phthalocyanine, and I read this type of CD is second in market share. So let's give the gold/silver CDs a 25% market share. Now let's assume the gold variety is about half of that, so the total gold CD market share is about 12%, or 1.2 billion CDs annually. With one ounce of gold good for 160,000-800,000 CDs, we need a block of gold every year that is from 2,400 to 12,000 cm³ or a cube with each side being 13 to 23 cm long (5 to 9 inches). This block would weigh 100 to 500 pounds and be worth 700,000 to 3,400,000 dollars. So there you have it. You have finished reading Presence of Gold in CD’s & DVD’s and many articles about Tech Gallery in our blog this, please read it. and url link of this article is https://littlebitjohnny.blogspot.com/2013/01/presence-of-gold-in-cds-dvds.html Hopefully discussion articles on provide more knowledge about the world of new tech gadgets.